I used water from this well to treat a tropical ulcer on the shin of my left leg by irrigating it several times a day. The nickname for such an ulcer was “Tropical Rose”. It occurred mostly on the legs and bloomed quickly into a blazing red swelling with a yellow center of pus. You can draw the association even further by imagining the dark streak running from the ulcerous wound to the lymph node in the groin as the stem. This dark streak was a feared symptom in the tropics indicating that a skin infection had become serious and was turning into a blood infection. Tropical Rose was a dangerous long-stemmed red rose. I need a quiet place where nobody will hang their nose over your private business. The far side of the well is good. People can’t readily see me and the ladies will not fetch water at this time of day. I will use water to wash out the wound. Good idea, flush it out. This is good. I can sit in the shade and have the sun on my leg. This is good. Look at those white clouds. That one looks like a cow, udders and everything. See if I can trace it with the broken twig floating in my eye. Hey great. I am an artist like ……., like ……. Why is drawing in the opposite direction more difficult? This artist needs more practice. I need to get on with it before somebody comes. The rose feels hot. Whoa, that is hot. Lucky it is more on the inside of my leg and I can get as close to it as I want. What would I have done if it were on the outside of my leg? OK, let us let these dead soldiers out. Paps (my Father) said that pus is an accumulation of dead white blood cells that rushed in to fight an infection. There must be millions of them. Whew, you guys stink. Must have been dead too long. This safety pin is doing the job. This does not hurt! Strange, no blood. Have to scrape all of these dead soldiers out, every last one of them. That hurts. Need to fill this bucket and dump water into the wound to clean it completely. Oh, oh, I have company. I have seen that girl before. About my age (11 ½ years) and she must be one of the original group living in this main part of the camp. Pretty and not a tattler. What do I say to her? “What are you doing?” she says before I can think of something. “Taking care of this.” I wave my left hand in the general direction of my legs hoping she will think I am just cleaning my feet. “H’m.” She looks straight at my handiwork. Not hearing a peep out of me she looks in my face, waiting for a more specific answer, I guess. She does not stare. She just looks, quietly. “How did you get hurt?” she asks. Yes, I could use her help with the water and she has already seen as much as can be seen, but I just can’t let her be more involved and have the word get out. No, thanks. “Yes, would you?” my mouth says. I tell her my plan of running water straight into the wound. 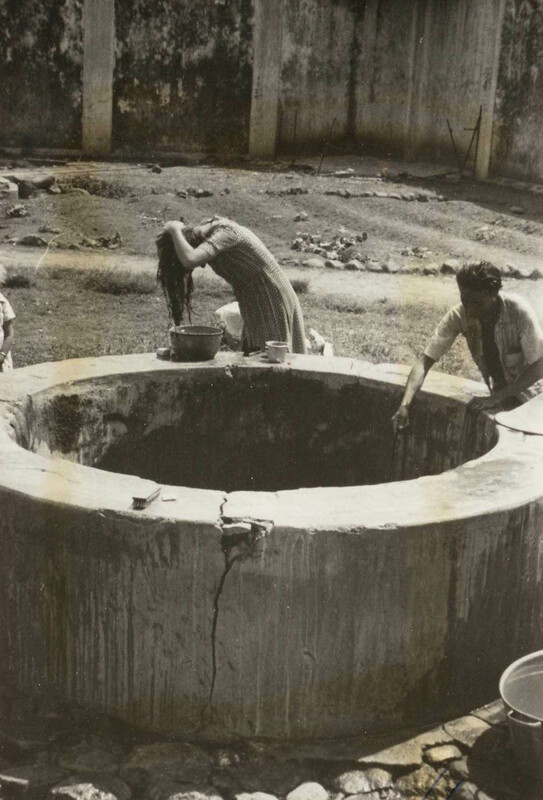 She nods, grabs the bucket and drops it into the well with the natural ease of someone who has done that many times before.